Does tax season have you frazzled? According to TaxSlayer, an estimated 52% of U.S. adults find the tax-filing process stressful, and we bet the other 48% aren’t too thrilled about it either. The good news is, there are a couple easy ways to feel better when April 15th comes around. The first is to get organized with time to spare, and file early. Pro-tip: Check out our handy Tax Filing Documents Checklist for 2019. The second is to take advantage of all the great discounts & freebies on Tax Day. Did you know? Tons of Boston area business are offering deals to take the sting out of preparing your return. The list below includes all the offers from last year, with updates as each confirms for 2019. Applebee's: Score $1 Hurricanes this tax season from the people that brought you the famous "Dollarita." Boston Market: Get a half chicken individual meal with two sides, cornbread and drink for $10.40 on Tax Day. Capriotti’s Sandwich Shop: Get a free “upgrade” on small or medium sandwiches on Monday. Mention the Tax Day deal. Chili’s: Get a $5 Cuervo Blue Margarita at participating locations on Monday. Chuck E. Cheese’s: Buy a large cheese pizza Monday through Thursday, get one large cheese pizza free. Great American Cookies: Get a free Cookies & Cream Cookie Monday at participating locations. No purchase is necessary. 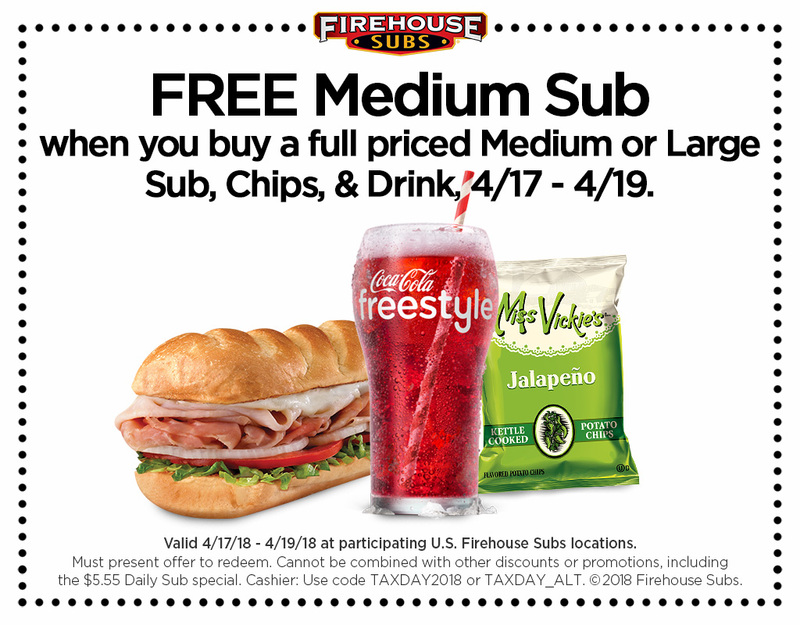 Firehouse Subs: Use this coupon for a free medium sub with purchase of a full-price medium or large sub, chips and a drink Tuesday through Monday. Hooters: Through Monday, kids 12 and younger get a free kids meal with an adult purchase of $10 or more. Hydromassage (at Planet Fitness): Score a free massage with coupon to de-stress this tax day. Kings Dining & Entertainment: “Dependents” bowl free. Kids 12 and under will get two complimentary games of bowling and shoe rentals on Monday April 15th. Kona Ice: It’s Kona Ice’s “Chill Out” Day. Look for the Kona truck during certain hours on Monday to get a free cup of tropical shaved ice. Click here to find participating locations and hours. Mrs. Fields: Until midnight on April 15, use code SAVETEN to get 10% off any order. Omaha Steaks: Place an online order for more than $59 and get a free 2-lb. ham. The promo runs through April 15, or until supplies run out. Potbelly Sandwich Shop: The first 75,000 people to sign up for the Potbelly Perks loyalty program will get a free sandwich. If you are already a member, you can get a buy-one-get-one-free sandwich offer loaded to your account Monday. QDOBA: Earn 1,040 (get it?) bonus points when you purchase an entree on April 15th. Zeel: First-time customers $20 off their first massage with the code “TAXDAY2019” for the entire month of April. Note: Some of the deals above will not be offered at every location, as not every franchise honors the deals. Call ahead to your local restaurant or shop to make sure they are honoring the offer for 2019.